The first violin part for Beethoven's Coriolan Overture, Op. 62 has been edited by Richard Roberts, concertmaster of the Montreal Symphony Orchestra. Roberts' bowings, fingerings and other editorial markings have been added throughout the score. Beethoven composed the Coriolan Overture in 1807 to Heinrich Joseph von Collin's 1804 tragedy. The main C minor theme represents Coriolanus' resolve and war-like tendencies as he is about to invade Rome, while the more tender E-flat major theme represents the pleadings of his mother to desist. It premiered in March of 1807 at a private concert of the home of Prince Franz Joseph von Lobkowitz. 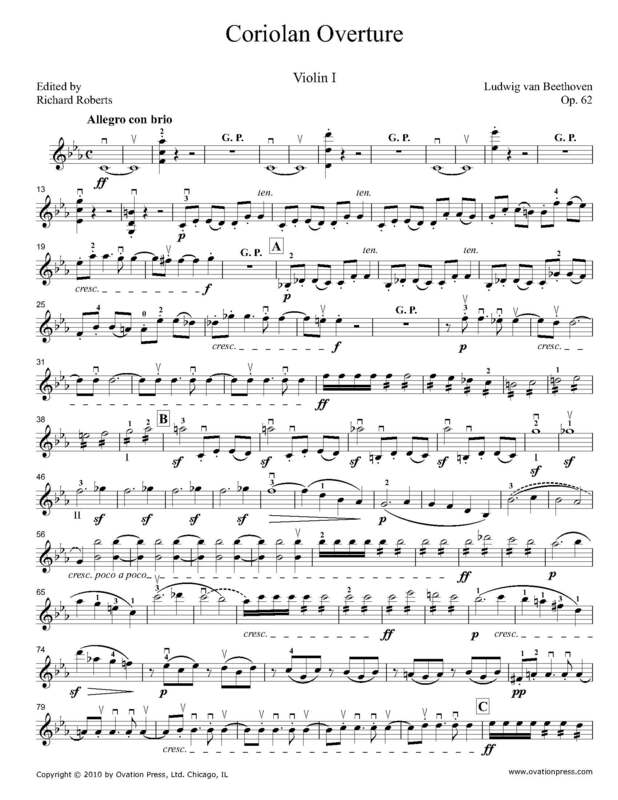 Download and print the score today to gain access to expertly edited Beethoven Coriolan Overture violin fingerings and bowings from Richard Roberts!